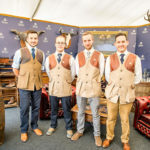 This year’s Game Fair, to be held at Hatfield House, Hertfordshire, from Friday 28 to Sunday 30 July, will include demonstrations from Daryll Pleasants, who specialises in training dogs to help with anti-poaching efforts in Africa. Daryll, who has been involved with anti-poaching efforts for five years, is working on projects in Zimbabwe, Tanzania, Mozambique, Namibia and Kenya through the organisation Animals Saving Animals, where he is helping to protect the last northern white rhinos. Daryll, formerly a military instructor with the Royal Army Veterinary Corps, has given numerous demonstrations and talks, including at the Royal Geographic Society, and has just finished filming a documentary for Inside Out on the BBC about his work training anti-poaching dogs. Images courtesy of Westley Richards & Hicks and Brown.